mai | 2011 | Joyeuse errance ! There are some things that you, the reader of this preface, know to be true, and others that you know to be false; yet, despite this extensive knowledge that you have, there remain many things whose truth or falsity is not known to you. We say that you are uncertain about them. You are uncertain, to varying degrees, about everything in the future; much of the past is hidden from you; and there is a lot of the present about which you do not have full information. Uncertainty is everywhere and you cannot escape from it. Truth and falsity are the subjects of logic, which has a long history going back at least to classical Greece. The object of this book is to tell you about work that has been done in the twentieth century about uncertainty. Research is carried out by individuals and often the best research is the product of one person thinking deeply on their own. For example, relativity is essentially the result of Einstein’s thoughts. Yet, in a sense, the person is irrelevant, for most scientists feel that if he had not discovered relativity, then someone else would; that relativity is somehow ‘‘out there’’ waiting to be revealed, the revelation necessarily being made by human beings but not necessarily by that human being. This may not be true in the arts so that, for example, if Shakespeare had not written his plays it would not follow that someone else would have produced equivalent writing. Science is a collective activity, much more so than art, and although some scientists stand out from the rest, the character of science depends to only a very small extent on individuals and what little effect they have disappears over time as their work is absorbed into the work of others. Je ne sais pas pour vous, mais moi, quand je lis ça, j’ai envie de m’installer dans un fauteuil et lire toute la journée. Do you know what heritability is, do you? Genetics is the study of genes. When they were « invented » (i.e. conceptualized) in the 19th century, genes were defined as units of heredity. Thanks to the revolution of molecular biology, we now know that a gene is a section of DNA (although it is still possible to debate on the precise meaning of this statement). But what I am interested here, is to ask a few questions about quantitative genetics, and especially heritability. Indeed, this notion of heritability is key in genetics (and, by extension, in biology as a whole) but it is often obscure for many biologists (notably for me, until I decided to seriously read some papers, and thus write this post to be sure I understood properly). And you, the reader, even if you think you know everything about heritability, I hope it can still be worth the reading. But let’s start with basics: Gregor Mendel and the birth of genetics. This Austrian monk was interested in inheritance (passing of traits from parents to offsprings). To study this phenomenon, he worked with pea plants and chose seven characters to study, but let’s focus on one: seed color. Mendel observed that some pea plants had green seeds while others had yellow seeds, we will speak of a « green » phenotype and a « yellow » phenotype. Intrigued about what would happen with offsprings, he started by crossing the peas having green seeds among themselves during several generations, idem for the peas with yellow seeds (selfing is possible in this species). After doing this for several generations, he always observed that peas with the « green » phenotype always had offsprings with the « green » phenotype, and reciprocally for the « yellow » phenotype. These offsprings resulting of several generations of selfing were called « pure lines« , as they were obtained by crossing plants with the same phenotype. Then, Mendel went on to cross a yellow male plant (denoted as P1) with a green female plant (denoted as P2), and named the offsprings the F1 generation. He observed that all F1 plants had green seeds, as if the yellow material disappeared. He also observed such a result when doing the reciprocal cross: a green male plant crossed with yellow female plant gave green offsprings. He therefore decided to qualify the « green » phenotype as dominant and the « yellow » phenotype as recessive. Then, he continued his experiment, and crossed F1 plants together to obtain F2 plants. And here, what is interesting, is that some F2 plants had the « yellow » phenotype (although most had the « green » one): as if the « yellow » material, somehow, jumped from the P generation to the F2 generation…! At this point, Mendel had the genial idea of counting the plants: he found that 3/4 had the « green » phenotype and 1/4 had the « yellow » phenotype, i.e. a 3:1 ratio. In front of such a striking observation, Mendel went on to characterize the F2 generation. And here again, he observed something strange: when crossing « green » F2 with themselves, some had only « green » offsprings but some had a mix of « green » and « yellow » offsprings, here also in a 3:1 ratio. This was not the case when selfing the F2 « yellow » plants. Therefore, the F2 « yellow » plant seemed to be « pure » as the P « yellow » plants, but 2/3 of the F2 « green » plants were like the F1 plants, and 1/3 were « pure » like the P « green » plants. random fertilization, i.e. gametes combine together to form an organism without regard to which allele is carried. Ok, now, let’s look at another classical example which, at the end, introduces quantitative genetics, and from there on, heritability. We are now in the early 20th century and the American geneticist, Edward M. East, also has fun with crossing plants. He worked with a species related to tobacco, some of the plants having a long corolla, ~90mm, some having a short one, ~40mm. As Mendel, he started by selfing plants with a long corolla, idem for the plants with a short corolla. Thus, after several round of selfing, he got two « pure » lines: one pure line with a long corolla (we will call them the P1), and one with a short one (P2). He crossed plants from P1 with plants from P2 and got F1 plants having a medium-size corolla, ~65mm. Until here, everything seemed fine. But when he crossed F1 together to obtain F2 plants, he didn’t get the 3:1 ratio of corolla length. Instead, he got plants with a corolla of ~65mm on average, and a much larger variability (the appropriate mathematical term is variance). To understand a bit more what happened, he chose F2 plants with a small corolla, crossed them, and obtained F3 plants also with a small corolla. When he crossed F2 plants with a medium corolla, he also obtained F3 plants with a medium corolla. And so on (see the picture below). This means that the inheritance of the corolla length has indeed a genetic component, but not as simple as the Mendelian case seen above. It is very likely that, instead of a single one, it is several genes that influence the length of the corolla. Let’s imagine that 5 genes are involved, each with two alleles, + and -, and that the each + allele lengthens the corolla by 1mm, whereas each – allele shortens the corolla by 1mm. The P1 plants with a small corolla are likely to have only the – allele at each of the 5 genes, whereas the P2 plants with the long corolla have the + allele at each of the 5 gene. As usual, the F1 plants have 5 – alleles, coming from their P1 parent, and 5 + alleles from their P2 parent. 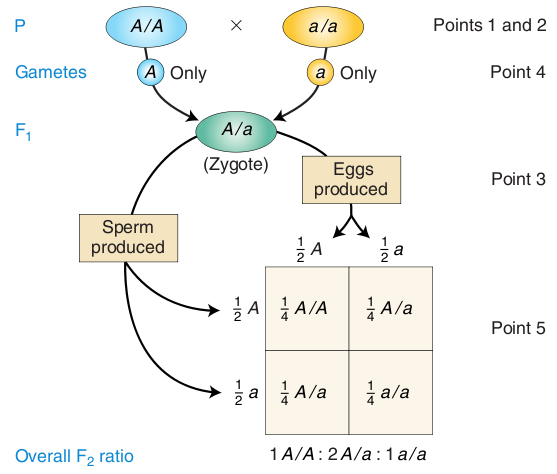 However, when producing the F2 generation, recombination occurs in all gametes from the F1 parents, and thus F2 offsprings will have different numbers of + and – alleles. Consequently, F2 offsprings will have a wider range of corolla lengths than their F1 parents. If there is genetic variation, what are the norms of reaction of the various genotypes? How important is genetic variation as a source of total phenotypic variation? Do many loci (or only a few) contribute to the variation in the character? How are they distributed throughout the genome? I won’t answer all of them because it would be way too long (! ), and in these times of whole-genome sequencing, lots of ongoing research is still underway… But I can still say a few words more. Misconception: what differentiates a Mendelian trait from a quantitative one is the number of genes involved. Although, the earlier part may suggest it, this is false. 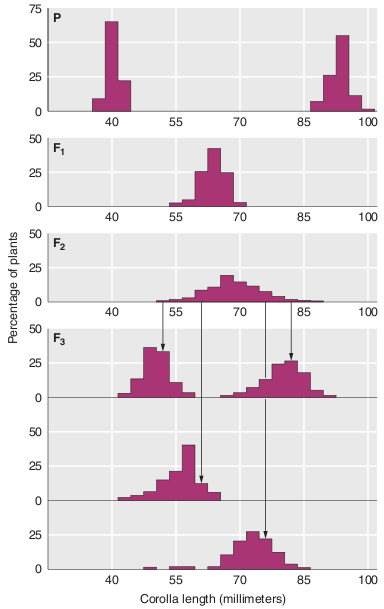 The critical difference between Mendelian and quantitative traits is not the number of segregating loci, but the size of phenotypic differences between genotypes compared with the individual variation within genotypic classes. The scheme below should make this clear. It represents the phenotypic distribution according to the genotype at a given bi-allelic locus, height being the phenotype of interest. Hence, the definition of a quantitative character becomes: a quantitative character is one for which the average phenotypic differences between genotypes are small compared with the variation between individuals within genotypes. After all this, what is heritability? Well, it’s simple. Let’s take a given phenotype, whatever it is (seed color, corolla length, hair color, disease status, growth rate, milk production…). The phenotype is the result of the interaction between genotype and environment. That is, a given genotype in a given environment may not lead to the same phenotype as the same genotype in a different environment, or as a different genotype in the same environment. That’s why the notion of reaction norm is essential. But still, people always want to know how much genes contribute to some phenotypes. Is it possible? Here again, it’s tricky. Let’s take the example of two bricklayers building a wall. If both of them work in parallel, that is one builds the left of the wall and the other builds the right, it is possible to assess their respective contribution: we just have to count the number of bricks each made. But if now one makes mortar, and the other lays bricks, it is not possible anymore to compare their work (it would be absurd to do it). And it is the same for genes. The question “Is a trait heritable?” is a question about the role that differences in genes play in the phenotypic differences between individuals or groups of individuals. Misconception: a high heritability means that a character is unaffected by the environment. Hell, no! Because genotype and environment interact to produce the phenotype, no partition of variation into its genetic and environmental components can actually separate causes of variation. But a highly heritable trait means that the genetic component is much more important than the environmental component in contributing to the variation in phenotype. You are currently browsing the Joyeuse errance ! blog archives for mai 2011.